Exp359. JOIDES. Vous avez dit susceptibilité ?…. The JR drillers are busy drilling 24 hours a day, 7 days per week. Students have many questions about drilling and since the driller are busy on the rig-floor I went to the JR Logging Engineer Clay Furman for answers. Let’s start with why we drill. The ocean floor is rich with information buried in sediments that have settled layer by layer over a long period of time. Sediments collected in cores from deep beneath the ocean floor contain stories of volcanoes, plate tectonics, climate, and evolution. Scientists look for evidence of past climates by exploring mircofossils, pore water, and other secrets hidden in these sediments. This is the best way to learn more about how our planet has changed over millions of years. When do we core and when do we drill? We core when there is interest in collecting geological samples for the specific expedition mission. 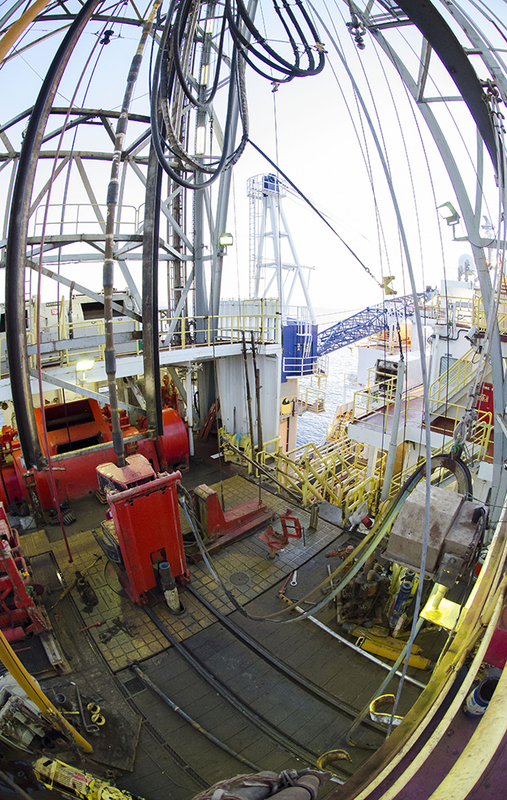 When we want to reach ocean sediments that are deeper quickly that’s when we drill. Drilling allows us to advance quickly to reach our target depth, but we do not always collect cores along the way. Collecting core alone the way takes to much time. Generally we core everything, but occasionally drill ahead without coring. Drilling only happens if we are making a logging hole that will be dedicated to taking downhole measurements. What types of bits do you use for coring? It depends on the coring system being used. For APC, the core is collected ahead of the bit using a hydraulic piston, then the bit drills through the interval that has been cored before collecting the next sample. For XCB and RCB, the coring bit is rotated along with the pipe, so the coring is effectively being done while drilling. How often does the drill get replaced? which equates to 3 or 4 days. Depending on the severity of the storm coring my or may not continue. The JR Captain carefully monitors weather and if it looks like a major storm is going to reach the ship, we change drill site or stop drilling until the storm has passed. If we are in transit the Captain may change course or decide to ride out the storm. How does the JR maintain a stable position during drilling? Maintaining vessel stability is a critical and complex task, largely handled by computer. The first and most critical consideration is staying afloat, of course. As we deploy pipe to drill, our effective weight in the water does not change, as the pipe (being pulled down by gravity) is still being held up by the ship’s buoyancy whether it is on deck or suspended below us. If the pipe should get stuck in the formation and the drillers apply more pull than the free weight of the pipe (over-pull), the ship must provide additional buoyancy to counteract that effective additional weight. A dynamic positioning (DP) system, which consists of a GPS receiver, a sonar buoy, and several thrusters allow the ship to move in any direction (even sideways). The ship can therefore compensate and constantly readjust to the movements caused by drilling.